An early Sunday morning review is here for you, SPC faithful! It's for a game that released in Europe last month on the Wii U eShop, but now it's available for gamers in North America. It's Olympia Rising, published by PlayEveryWare and developed by Paleozoic. The old school pixel visuals of Olympia Rising fit right in with a lot of other indie games. To say that there are a lot of indie games gunning for memories and nostalgia of playing 8-bit games would be an understatement. 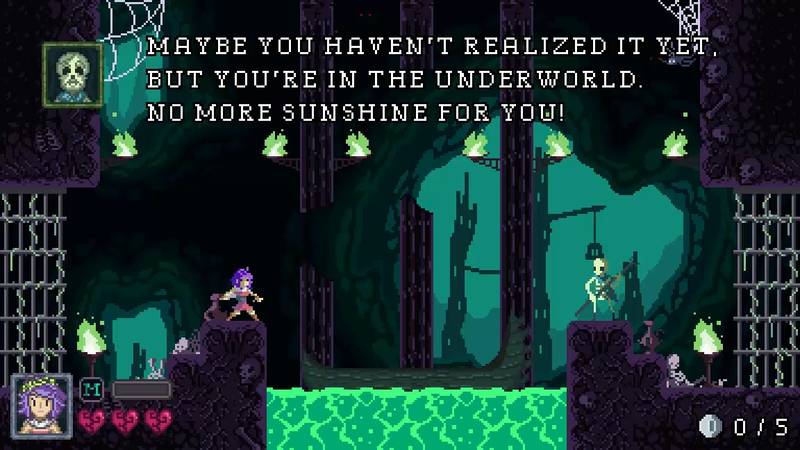 Nonetheless, Paleozoic's Olympia Rising stands out enough by not only having an original concept to it, despite it being a 2D platformer, but by being an affordable and fun purchase for Wii U gamers. You play as Iola, a warrior who has met her a terrible fate by being slaughtered in battle by a monstrous beast. Cast to the Underworld, Iola wants nothing more than her soul to be revived through reaching Mount Olympus. Not the easiest quest, however, as not only are there dozens of chambers full of death and danger, but a gatekeeper named Charon wants payment in the form of coins to let her pass each gate she comes across. Charon is full of funny quips throughout the game. Thus, this is the main structure of Olympia Rising: you play through various levels of varying linearity, collecting enough coins from defeated foes and those laying about to pay Charon to allow Iola to progress. Reach a gate without enough coins, and you are sent back to the start of the level. Most levels are there for you to explore. Many of the harder-to-reach or more dangerous locations of levels house the greatest bounty of coins. Thankfully, Iola has a fair amount of abilities to her for both combat and for mobility. Iola's regular attack is done with a short sword. The range could be better, sometimes giving certain enemies an unfair advantage because their attack reach is farther while Iola has to move up close to them. Our heroine can also acquire magic abilities to give herself a better edge in combat, such as a burst of fire great for long-range attacks, a water shield for added defense, and a lightning magic that bestows higher power for sword strikes. 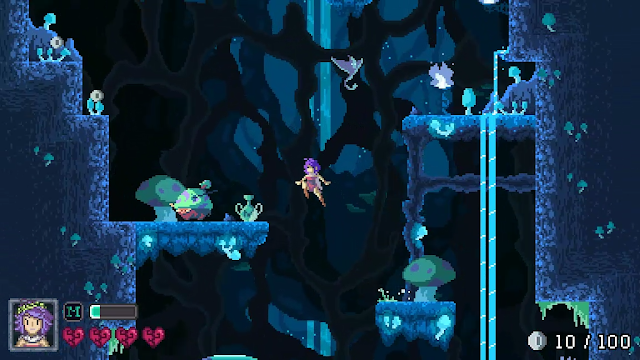 As for mobility, Iola can perform a double jump, but if she defeats a foe, not only can she jump once more, but if she keeps defeating enemies without touching the ground, then she gets a combo boost. This gives Iola more coins than she would otherwise get, so it's usually a good idea to defeat a bunch of enemies via combos to boost her coin total. Alongside jumping, Iola has the ability to hold onto walls, almost doing her best Mega Man X impression with repeated wall scaling. The environments are just gorgeously done. Just don't let yourself get distracted. The other type of level has Iola racing upwards to avoid a pursuing lake of lava that slowly fills a level. These levels require less coins to open the gate due to their linearity and lack of time to explore. However, these levels also sport an abysmal frame-rate, which many times resulted in me missing jumps or attacks, sometimes resulting in Iola's death. No time to dawdle, Iola-- you have a flow of lava at your feet! That isn't the end of Olympia Rising's technical problems, either. I ran into a glitch where Iola had one heart left, and I accidentally hit a tutorial scroll while in the middle of dealing with an enemy. This caused Iola to stand still while I had to read the message, but the enemy still was able to attack my extremely vulnerable character. This resulted in death, of course, but the strange occurrence wasn't until I was revived back at the start of the level. I still couldn't move, nor pause the game to back out of the level, and had to reset the game. After three main levels, Iola encounters a boss. These battles are a good amount of fun and require you to memorize a foe's pattern. However, once a boss's pattern has been learned, it's pretty easy to defeat them, as they don't stray from their pattern or become more difficult as they approach death. Once a boss's pattern has been learned, the battle becomes much easier. When a boss has been defeated, they leave a heart behind to add to Iola's maximum health, and brings her to a different themed set of levels. Olympia Rising's difficulty curve is done so well that you may think the game would get easier with more health. However, the added enemies placed in later levels become more challenging as you play along, so you're not really getting an overwhelming advantage. 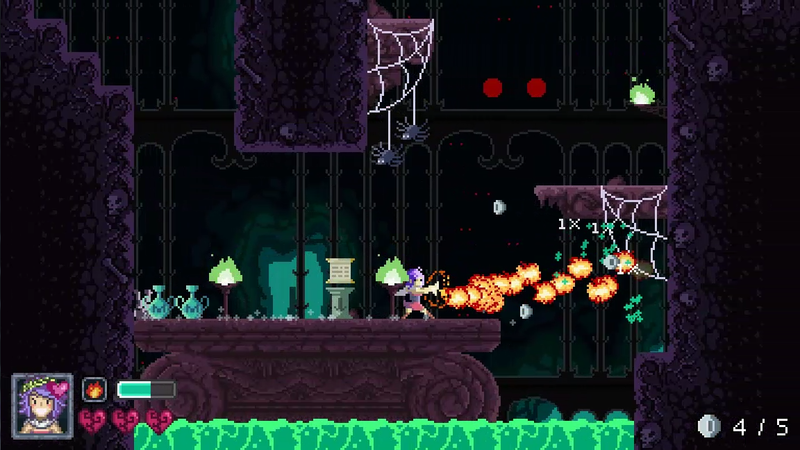 The visual style of Olympia Rising is full of glorious pixel goodness. Characters are designed well and animate beautifully. Environments are detailed, but there is a problem occasionally with being able to distinguish between platforms and what is actually just the background. Thus, it can be a bit of trial and error to determine what you can jump on and what you cannot. Meanwhile, the music is full of old school boops and beeps, wonderfully harking back to the sounds of the NES. Olympia Rising isn't an overly long game, but at the same time, its price tag of around five dollars makes it a worthwhile purchase, pending you are patient enough to experience death over and over again. And you definitely will, as the game is rather challenging in an old school way. That said, there really is no replay value to be found with Olympia Rising, other than replaying through the game. Perhaps using coins for something other than passing through gates would have extended the length of the game some. Still, what Olympia Rising offers is an affordable adventure that will test your action-platforming mettle flaws and all.